DVD cover. Photo courtesy of Tsuburaya Productions. 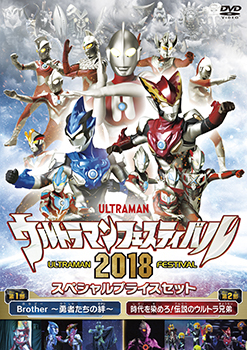 Tsuburaya Productions has announced the Japanese DVD release of ULTRAMAN THE LIVE ULTRAMAN FESTIVAL 2018 (ウルトラマン THE LIVE　ウルトラマンフェスティバル2018, Urutoraman THE LIVE Urutoraman Fesutibaru 2018) on February 15, 2019. 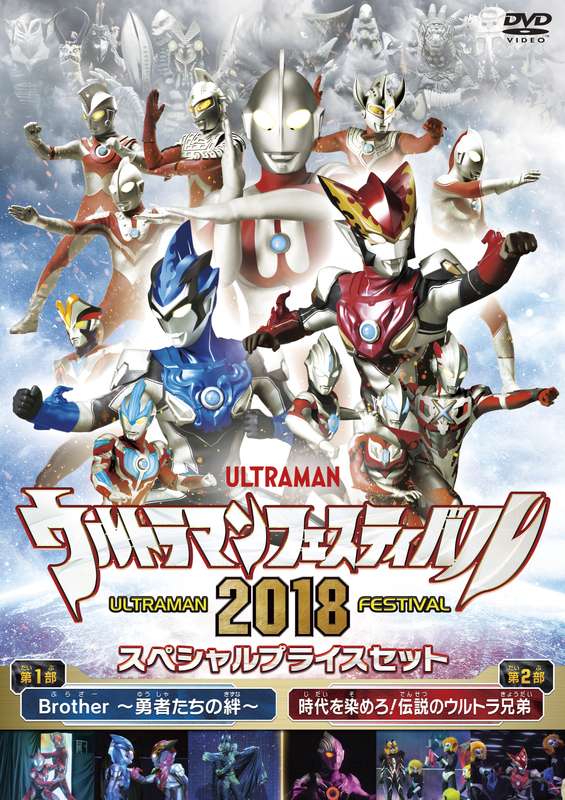 The DVD features two “Ultra Live Stage” performances from the 2018 ULTRAMAN FESTIVAL, the summer vacation event held in Tokyo from July 20-August 27. This year’s show attracted more than 100,000 attendees, bringing the total number of visitors to the annual ULTRAMAN FESTIVALs to over 4.8 million. Ahead of the street date, advance copies of ULTRAMAN THE LIVE ULTRAMAN FESTIVAL 2018 will be available for purchase at two Ultraman events. The ULTRAMAN FESTIVAL IN HIRAKATA PARK 2018-2019 (ウルトラマンフェスティバル in ひらかたパーク2018-2019, Urutoraman Fesutibaru in Hirakata Paaku 2018-2019) is scheduled from Saturday, December 22, 2018 to Sunday, January 20, 2019. The Festival will be closed from Tuesday, January 8-Friday, January 11 and from Tuesday, January 15-Friday, January 18 due to Hirakata Park holidays. The ULTRA HEROES EXPO EXPO 2019 NEW YEAR FESTIVAL IN TOKYO DOME CITY (ウルトラヒーローズEXPO 2019 ニューイヤーフェスティバル IN 東京ドームシティ, Urutora Hiiroozu Ekisupo 2019 Nyuuiyss Fesutibaru IN Tokyo Doomushiti) will be held from Saturday, December 29, 2018 through Sunday, January 6, 2019. 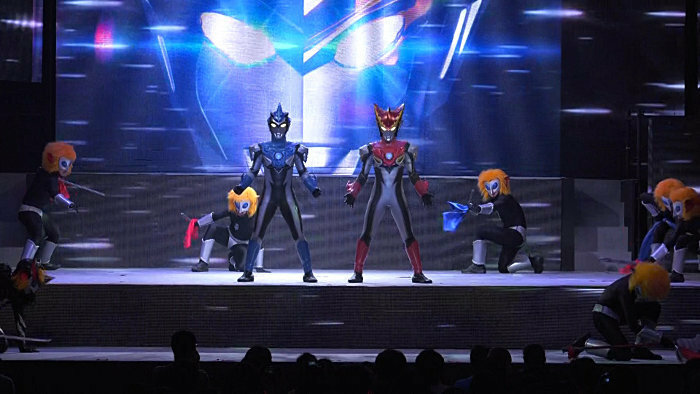 The live stage shows features the heroes of the new ULTRAMAN R/B (RUEBE) [ウルトラマンＲ／Ｂ(ルーブ), Urutoraman R/B (Ruubu), 2018] television series — Ultraman Rosso (voiced by Yuya Hirata) and Ultraman Blu (Ryosuke Koike) — plus Ultraman (Takahiro Sakurai), Ultraman Taro (Miyu Irino), Ultraman Gaia (Takeshi Yoshioka), Ultraman Agul (Hassei Takano), Ultraman Zero (Mamoru Miyano), Ultraman Ginga (Tomokazu Sugita), Ultraman Geed (Tatsuomi Hamada) and more! In the first performance, which ran from Friday, July 20-Monday, August 6, 2018, Alien Empera — a great evil once feared throughout the universe — is revived! Ultraman Geed and the Ultra Brothers challenge the space emperor, who uses his power to create dark giants! As the Ultra Heroes struggle to restore peace, two new lights appear to aid them! 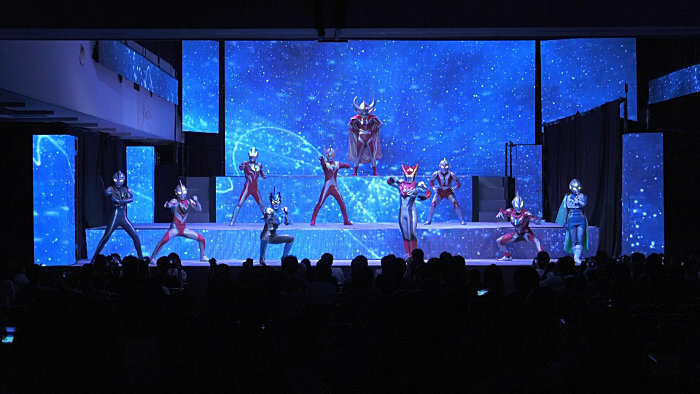 The second stage show ran from Wednesday, August 8-Monday, August 27, with the Alien Magma launching their invasion of Earth by overrunning the ULTRAMAN FESTIVAL venue! Ultraman Rosso and Ultraman Blu come to the rescue, and are soon joined by the legendary Ultra Brothers!